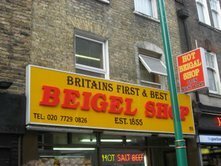 Plain bagels only. A great value at 18p each. 80p with cream cheese. Open 24 hours, and the goods are made on-site. 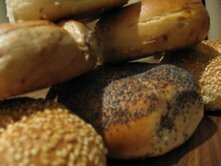 Very satisfying crunch to the skin of the bagel. Inside is nice and dense. Service is efficient and competent if a little rushed given the queues. Plain, sesame seed, poppy seed, cinnamon raisin, and onion. A bit pricey in comparison to their East End brethren at 48p each. £1.60 with cream cheese. Great tasting, and properly dense. Service is friendly and helpful. Plain, sesame, or onion. Super cheap at 15p each for plain, 20p for onion or seeded. 80p with cream cheese, £1.10 for cream cheese with chives. Good crunch on the outside, chewy (in a good way) inside. 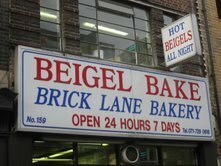 Service is a bit chaotic as they’ve got more on offer than the Brick Lane Beigel Bake, but the queues are shorter. Plain, sesame seed, poppy seed, cinnamon raisin, onion, caraway seed. 29p each, £1.50 with cream cheese. Products are disappointingly soft, bread-like, and sweet. Service on day of visit informed us that a bagel with cream cheese wasn’t an option. Supplied in a surly fashion upon further questioning.